We’ve discovered that you can get a proper English breakfast for a great price just about everywhere, apart from Sousse in Tunisia (although some hotels do offer it as part of your holiday package) and that daredevils are best off heading to Turkey for banana boating. If you’re feeling adventurous you might like to try the more expensive flying fish, which gives you more air time! 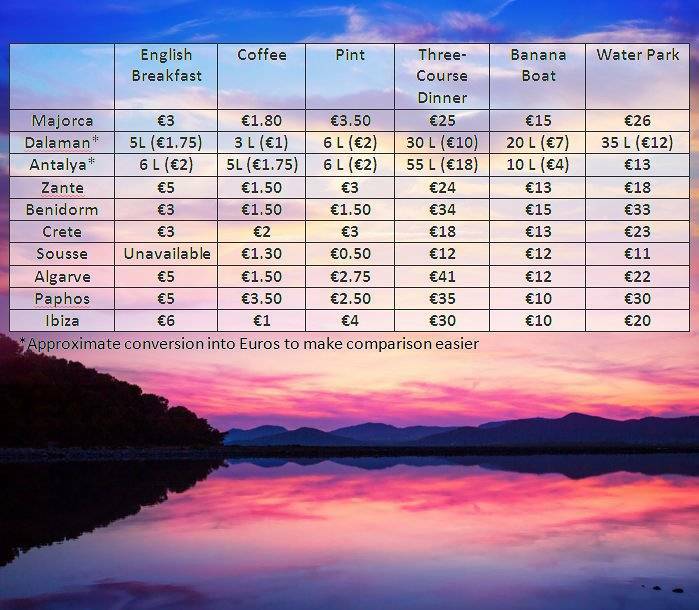 When it comes to eating and drinking you’ll get a bargain in Sousse but you can expect to pay the most in the Algarve, with Crete, Zante, Majorca and Turkey also at the lower end of the scale. Coffee lovers will find their daily fix cheapest in Ibiza, hardly surprising considering the huge clubs and all-night partying! Just back from any of our favourite destinations? Tell us how much you spent by contacting us on Twitter or facebook.